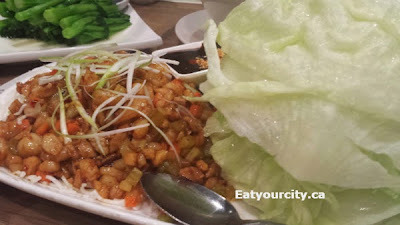 Eat Your City: Congee Queen Scarborough, ON - awesome comfort food congee and other tasty Chinese eats! Congee Queen Scarborough, ON - awesome comfort food congee and other tasty Chinese eats! 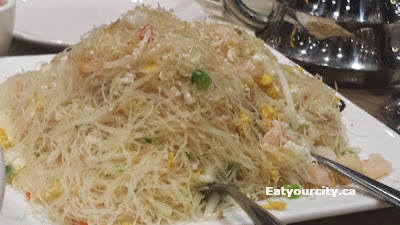 On one of the last nights in Toronto during the Easter long weekend, I think we're making it a tradition now - we stopped at Congee Queen for some quintessential Chinese confort food - Congee! And fried rice and... well, you get the picture. Staff is friendly, the kitchen is quick and the restaurant is elegant in warm woods, browns and golds. We went around the table and my family just picked whatever they felt like eating... and since we all love carbs, and carbs usually play an integral part of comfort food.. bring on them carbs baby!! :D Onto the food! First up was the Dough fritter rice noodle roll. Its essentially a savory crisp deep fried Chinese donut quickly wrapped in a soft tender thin rice roll and served with sweetened soy sauce, toasted sesame, hoisin sauce and peanut dripping sauce for a great cominatin of textures - soft, crisp, chewy and flavors - sweet, salty savory. Yum! Next up was my cousin's fav - the House seafood and chicken lettuce wrap. 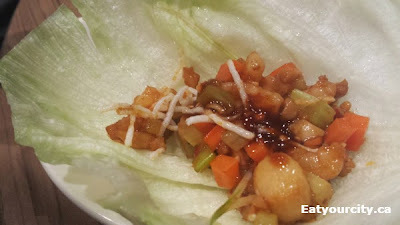 Moist diced sauteed chicken and scallops is mingled with refreshing bites of water chestnut, sweet crisp jicama, carrot, celery, onions all having a last in a slightly sweet and savory sauce and crowned with some thinly sliced green onions. Pop into a leaf of cool iceberg lettuce and you have yourself a lean, mean and tasty lettuce wrap nom! 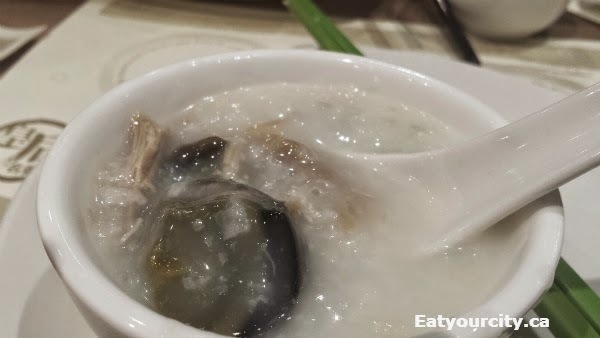 Can't go to a place called Congee Queen without having some congee - their versions are always loaded up with lots of seafood and ones loaded up with your choice of toppings (or you can pick the ones on the menu) the congee is reminiscent of a silky smooth rice stew. First up was the Shredded pork and gold preserved egg congee. There were lots of thin strips of seasoned pork to give the congee a tasty savoriness, while generous wedges of preserved egg added in depth, richness and earthiness to this traditional congee. Preserved egg is an acquired taste and I'm glad I acquired it! Nom! 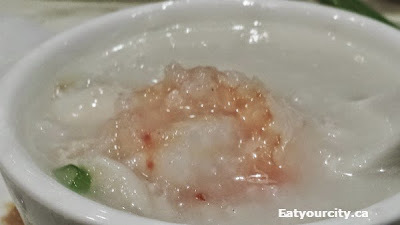 The Seafood Super Bowl congee with tiger shrimp, scallop, salmon, sliced fish, crab meat and squid was also a hit... how can it be not when the huge bowl it came in was almost half full of perfectly cooked succulent savory seafood? Mmm! 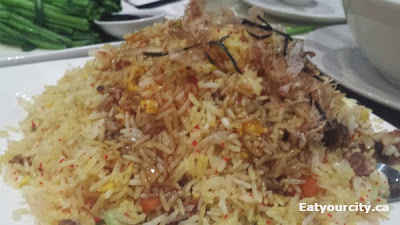 Empress fried rice with eel, fish roe and crab meat topped with waving flakes of bonito and toasted nori strips. This was my favorite non-congee dish of the night. 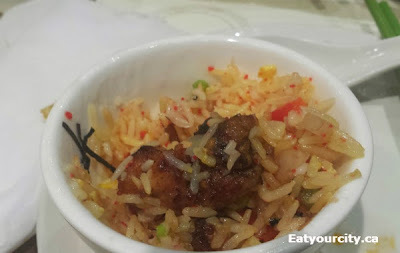 Nicely seasoned fried rice is tossed with lots of moist pieces of sauteed/grilled? eel and fresh crab meat. The fish shoe gives bright sweet unagmi pops of brightness and the sweet teriyaki BBQ sauce the rice is drizzled with pairs nicely with the smokiness of the bonito flakes. Nomnomnom! 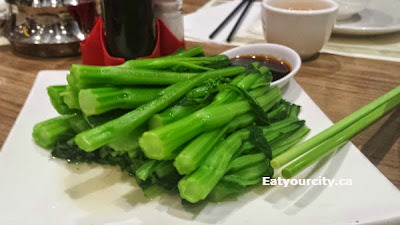 And we finished off with some steamed season vegetables, which turned out to be baby yu choy - tastes similar to a slightly sweet kale. 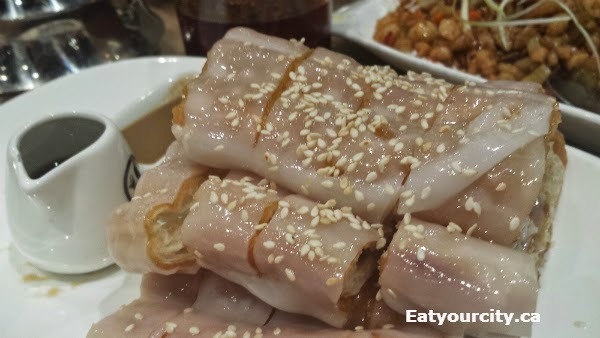 Congee Queen continues to be a great place for congee, Chinese noodles and rice dishes. Wonder if we'll see one on every corner like Tim Horton's the next time I head back to Toronto? Or maybe they'll start plunking restaurants in the west... wouldn't be a bad thing in my books! Great post, superb pics but it is located in Scarborough, not North York.